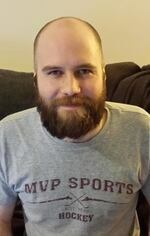 Benjamin Endicott Schilling, resident of Potsdam, NY, passed away on May 21, 2018, at Crouse Hospital in Syracuse, NY, at the age of 31 years. Ben was born in Potsdam, NY on February 18, 1987. He graduated from Potsdam High School in 2005 where he was a member of the varsity soccer, hockey, and golf teams, French club, and played the French horn in the band and orchestra. He earned his Bachelor of Science degree in Electrical Engineering in 2009 and his Master of Science degree in Electrical Engineering in 2013 from the University of Vermont where he worked as a teaching assistant and a research assistant. In May 2018, he earned a Master of Engineering degree in Electrical Engineering from Clarkson University where he was a research assistant performing biometrics research. Ben loved playing golf, reading, watching sports, and spending time with his friends and family. He had a passion for fantasy sports and organized multiple leagues for his friends and family. He was an avid animal lover and adored his cat Arya. Ben was admired for his easygoing nature and his warm and kind demeanor. Ben will be sadly missed by his mother, Sandra Harris, his father, Robert Schilling, his sister Samantha Schilling and her husband W. Jonathan Dunkman and their children William, Henry, and Emily, and his brother Stephen Schilling and his wife Amy Senta and their children Owen and Connor. There will be no calling hours. A memorial service will be held this summer at a time and place to be determined. Memorial donations may be made to the Potsdam Humane Society (potsdamhumanesociety.org) and Potsdam Youth Sports. To send flowers to the family of Benjamin Endicott Schilling, please visit our Heartfelt Sympathies Store.